Edited by Oliver666666, 19 May 2017 - 06:45 AM. Next will be some try-hard. Chervey, shouldn't their gem deltas also be recorded? Edited by Scoot, 09 November 2015 - 06:35 PM. Me nah, w/o $ you'll never win.. I orbed +15k like crazy. Here is what I was able to put together. Chervey is working on finding the exact delta for DoD, but he cannot promise anything. I've been in every KoK battle so far, it is only 7-8 at night when battles end so it is easy for me to check final results. I just missed a few, other thieves were able to help fill in all but one piece. Edited by Michael, 10 November 2015 - 02:53 PM. Wow! That's pretty impressive to just steal so many spiked gems to get 5 million delta! I would have thought for sure that a few golds were nabbed. 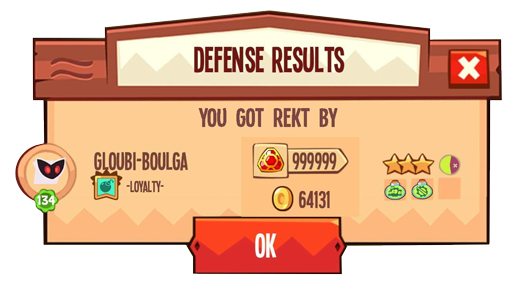 Even if you had stolen a 999999 gem that would have been less than 1/5 of your delta. LocationCanada, Alberta, Lethbridge, sitting in my room, watching Anime, with a sign on my door saying: Do Not Disturb! Those deltas are amazing! Congrats to everyone who won the KoK outfit. You deserved it!! The only way you can achieve a delta of 5mil+ is honestly having $ to just burn on the game. Or if you get extremely lucky. I really like how Michael and Chervey took their time, recorded this and calculated everything. 11.5m OMG!! Who is that Manlakesh ? Someone who was extremly determined to win the 1000 orbs and the KoK outfit. He did that to win gvg battle and won kok outfit in the process.